(CNS): Almost 800 people were involved in last week’s elections, and Supervisor of Elections Kearney Gomez has praised all those involved, saying, “A tremendous amount of work by an extraordinarily large number of people helped make the General Elections and Referendum of 20 May a resounding success for the Cayman Islands.” In a release from the E;ections Office, Gomez, along with Deputy Supervisors Colford Scott, Orrett Connor and Ernie Scott, paid tribute to those responsible for seeing that both voting processes ran smoothly. Workers included Registering Officers, Returning Officers and their deputies, Presiding Officers, Poll Clerks, administration and support staff, Logistics Officers, radio communication personnel, field officers, drivers and the more than 100 observers appointed by the Governor, Mr. Stuart Jack, for Cayman’s first-ever referendum. The Elections Office training staff held over 30 training sessions for the various groups of workers, who attended without recompense. Gomez also noted the contributions of the police officers who worked closely with the Elections Office throughout the polling hours and ballot counting, as well as for security requirements. Incidents involving the alleged handing out of cards with candidates’ names on Election Day have been turned over to police, Mr. Gomez said. Officers of the Special Branch are reportedly dealing with the matter. Mr. Scott pointed out that a Code of Conduct for Candidates was part of the handbook given to candi-dates on Nomination Day. The code asks candidates to solemnly declare that they, their agents and sup-porters “will contribute positively to a peaceful political atmosphere conducive to free and fair elections.” The code ends with an acceptance of valid elections. (CNS): Leader of the People’s Progressive Movement and outgoing Leader of Government Business Kurt Tibbetts has said it is the responsibility of the attorney general and the governor to deal with the apparent disqualification of Mark Scotland and Dwayne Seymour in Bodden Town. He said that before the governor swears in any candidate to the Legislative Assembly it is his responsibility to check they are qualified. 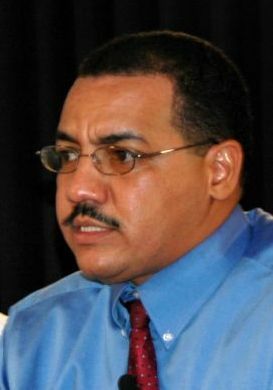 Although Tibbetts did not state that the PPM would not be challenging the result, in a speech to the country on television on Friday evening he indicated that he expected the AG and the governor to deal with the issue and not necessarily the two candidates from his own party — Osbourne Bodden and Charles Clifford — who both came in directly behind Seymour. However, a number of local experts in the field have indicated that the question of qualification must come as a legal challenge from either a candidate or from the district’s electorate. If no challenge is forthcoming, the governor may be obligated to swear in both candidates, despite the fact that the Constitution states they are disqualified. However, the only comment that the attorney general made before the elections was that the issue was a matter for the courts to decide. The governor had said that he expects all candidates in the forthcoming general election to operate within the terms of the Constitution and the applicable laws of the Cayman Islands, but also said cases of possible non-compliance with the legal requirements would be a matter for the courts. Tibbetts also raised the issue of the investigations currently being undertaken by the Elections Office and the police over the accusation of irregularities that took place in George Town, where the United Democratic Party was accused of handing out voting instructions in contravention of the Elections Law. “There havebeen serious allegations that UDP agents, supporters and some candidates attempted to unduly influence voters at some George Town polling stations on Election Day. These matters have been reported to the Supervisor of Elections and the police. We understand they are being investigated and that in due course a statement will be made regarding the outcome of those investigations,” he said. Tibbetts said, however, that the voters had spoken and the PPM respected their decision as that is the democratic process. He told the country that he and the party were disappointed but he said the five candidates who have been returned would proudly carry out their duties as representatives and as the parliamentary opposition. “As the opposition, our duty will be to question and criticize measures taken by government so that the public can better understand what is going on, and the government can be held to account. But we will do our best to perform our duty in a constructive way,” Tibbetts added. He also said that the PPM had brought a new culture of governance to Cayman offering open, honest and transparent government and making huge strides in key areas like education and infrastructural development. “We have much of which we can be proud,” he said, adding there were lessons to learn and that members of the PPM would continue the mission to offer the Cayman Islands the right kind of government. Speaking of the Constitution, Tibbetts said he was delighted that it had received the blessing of voters in the country’s first referendum. Thanking all those involved in the constitution process, the referendum and the election itself, he also offered his thanks to the civil service for the work they had done during his government’s time in office. Noting that it was not necessarily customary to thank them, he said it was important to acknowledge all the work that civil servants do. “Nothing can be achieved by a government without the civil servants. LA, Cabinet and the governor are the head of the government, but the civil service is the body. I hope the civil servants are proud of what we have achieved together in the last four years,” he concluded. (CNS): The Cayman Islands Constitution was passed on the say of less than 50% of the full electorate, though it did receive 62.2% approval from those who took part on Wednesday, 20 May, or 7,045 ‘yes’ votes. Although the new Constitution itself stipulates that a people-led referendum must receive an approval rating of more than 50% of the entire electorate (which is currently 15,361), this vote did not reach that figure. In order to achieve the new standard of referendum it would have required 7,681 votes to pass. However, the Referendum Law which was passed in the Legislative Assembly earlier this year only required a 50+% of the actual turnout, which was in the end 11,244 people, or around 69% of the entire electorate. Susan Bothwell from the Constitutional Secretariat told CNS that she felt that given this was Cayman’s first ever referendum it was an impressive result. “I believe it was a tremendous turnout considering this was the country’s first ever referendum. The numbers are quite impressive and the truth of the matter is most people who voted in the General Election also took part in the referendum,” she said. “The country’s mandate has been ‘yes’ for acceptance of the Constitution. Now the work will begin to prepare for the implementation of the new Constitution." Although the result was bitter-sweet for Alden McLaughlin, the former minister who, along with Kurt Tibbetts the outgoing leader of government business, has been associated most with the drive for constitutional modernisation, he told CNS he was delighted that the people had voted ‘yes’ in the referendum despite the election result. “We are very please that the new Constitution has been approved and this document will be around a lot longer than any political administration,” he said. 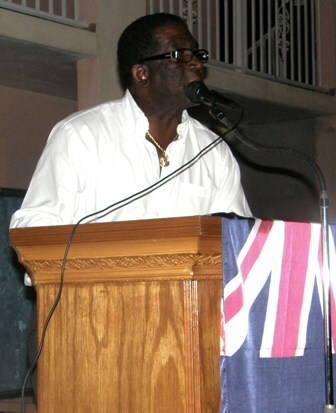 Governor Stuart Jack expressed his pleasure at the outcome and said it wasas a result of three rounds of negotiations between the government of the United Kingdom, the Cayman Islands government, the opposition, and non-governmental organisations, representing the churches, the local business community and the Human Rights Committee. Bothwell too felt that it was important for the secretariat to continue its work following the result to help educate people about what it means to them and to assist with its implementation. “I definitely see a future roll and function for the secretariat in terms of education,” Bothwell said, adding that she herself had been seconded and so the unit may well be headed up by someone else in the future, but either way she hoped it would continue on with its work of informing and educating. This morning, the UK’s Foreign Office Minister Gillian Merron welcomed the acceptance of the draft Cayman Islands Constitution Order at the referendum on 20 May and congratulated the United Democratic Party on its election into Government. “I am delighted too that the draft new Constitution has been accepted by the people of the Cayman Islands. As I said in February at the conclusion of the final round of talks, which I was honoured to chair, the new Constitution will be an important step forward for the people of the Cayman Islands,” she said, adding the she recognised the debate surrounding the Bill of Rights. “I am convinced that it is an important first step in the enhancement of human rights protection in the Cayman Islands, and that it will raise awareness of and strengthen respect for human rights in the Islands. The new Constitution will also help to ensure the increasingly high standards of good governance to which the UK government attaches considerable importance. “We look forward to working with the new government of the Cayman Islands towards timely implementation of the new Constitution Order. I know that it will entail a great deal of work, and I am grateful for the efforts that have already been made to help ensure a smooth transition," Merron added. Although some elements of the Constitution will be implemented immediately, the Bill of Rights will be phased in over a period of three years. Also, certain domestic laws may have to amended and new ones passed in order to ensure the national legal framework is compatible with the requirements under the Cayman Islands Constitution 2009. Both Scotland and Dwayne Seymour’s election remains contentious since neither of them met the criteria under the Constitution to be elected to the Legislative Assembly as they both failed to declare their business contracts with government before the deadline set out under Section 19. During the elections campaign the issue was declared by both Kearney Gomez, the Supervisor of Elections, and Attorney General Sam Bulgin as a matter for the court, as they said there was no mechanism for removal from the election beforehand. The challenge can come not just from losing candidates but also from any Bodden Town voter. The question as to whether a judge would simply rule that Osbourne Bodden and Charles Clifford would be duly elected or initiate a by-election in which the candidates may or may not be allowed to run all still remains open to question. (CNS): Police said that detectives have arrested a 28-year-old man on suspicion of attempted robbery following an incident at Scooters and Wheels on South Church Street on Tuesday (May 19). The 911 Emergency Communications Centre received a call at approximately 11.25am from a staff member reporting that a man armed with a knife had entered the store and demanded cash. The worker told the offender that there was no cash on the premises and he left empty handed.